The grandfather of today’s leaf blower was designed to spread fertilizers and pesticides on crops and fruit trees. In the late 1960’s and early 1970’s, landscapers realized that this blower – without the container for chemicals – could be used to move leaves and other yard debris. Manufacturers responded by designing a leaf blower that could be used by homeowners and lawn care and landscape professionals. Today, manufacturers continue to research and develop new improvements for further reducing leaf blower sound and emissions. Since their introduction, leaf blowers have rapidly become an essential time and labor saving clean-up tool for landscape maintenance professionals and homeowners. Leaf blowers are extremely efficient for cleaning leaves, grass clippings, and debris from driveways, sidewalks, patios and porches. In these situations, a leaf blower is more time and cost efficient than a rake or a broom. Leaf blowers also perform tasks like cleaning areas covered by mulch or bark more effectively than hand tools. When used properly, there is little disturbance to the surface. There are two main types of leaf blowers: hand-held and backpack models. Both types are usually powered by either a 2-stroke or 4-stroke engine. Some hand-held blowers also provide a blower-vacuum combination. There are many different models, attachments and performance options available for different applications. Compared to leaf blowers manufactured in the early 1990’s, today’s leaf blowers are quieter and cleaner. Newer leaf blowers are quieter than older ones by as much as 70%, and manufacturers are continually working to further reduce noise levels. Leaf blowers are definitely controversial pieces of equipment. Gas powered models are loud and require hearing protection for the operator to avoid ear damage. However, neighbors probably aren't willing to put on hearing protection every time you fire up your leaf blower. When possible, use a broom to clean small areas. Keep gas powered blower use to a minimum. Follow local rules and ordinances about when to use leaf blowers. Do not use very early in the morning or very late in the day. Check wind direction and intensity. Never point the nozzle or blow debris toward people, pets, cars or houses. Do not blow debris toward open windows or doors. Always be considerate of people passing by and of property. Do not leave the blower running when unattended. Do not use a blower to spread or mist fertilizers, chemicals or other toxic substances, unless it is designed for these purposes and in an appropriate area. Use the lowest possible throttle speed to do the job. The general idea of a leaf blower is simple. A high-speed fan is surrounded by a cover. Tubes are connected to the side of the fan to focus the air current (up to around 200 miles per hour in some units) in the direction you want to move the leaves. There are two main types of leaf blowers. Blowers perform the single, simple function of blowing material. Blower/vacuum combinations combine the blower function with a vacuum feature. 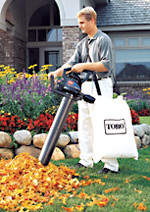 Leaves or debris can be directed into an attached bag, which makes this type of unit great for vacuuming leaves from shrubs. An additional mulching feature is available on some leaf blower/vacuums. Mulched lawn debris can be used in compost piles or bagged for disposal. Most convert easily from blowing to vacuuming mode. 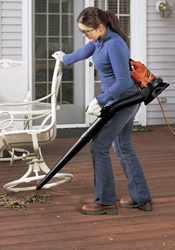 When considering the purchase of a leaf blower, you can choose between an electric or gas-powered unit. Gas blowers are more powerful, but electric ones are quieter. Do you live in a congested neighborhood where quiet operation would be appreciated? Or is the yard large with lots of trees, making a powerful unit the logical choice? Expect to pay anywhere between $100 - $500 for a blower, depending upon the specifications. Before purchasing a leaf blower, check with your local community on regulations that govern leaf blower use. They have been banned in a number of communities because of the noise pollution they cause. Remember, a rake costs a lot less and you can think of it as a seasonal workout tool. Electric leaf blowers are lighter, quieter and vibrate less than gas units. An electric motor drives the fan, so there's no need to mix fuel or refill. For quick daily sweeps of patios and other hard surfaces cordless leaf blowers are typically quieter, very light (only 5.5 pounds) and batteries that take a 3-hour charger. Reviews say one battery is good for about 15 minutes of use, ample for most decks and driveways. For sweeping hard surfaces within 150' of an outlet. These blowers are light and somewhat powerful enough to easily blow off a driveway. On its single speed, the sound level is only about 65 decibels (measured at 50' away). Most gas-powered leaf blowers use a 2-cycle engine, requiring mixing oil and gasoline. Mobility and work output are increased with gas blowers. They're louder and heavier than electric blowers. If you need to use a leaf blower beyond the range of an extension cord, and have a large area to sweep, the gas powered model is required. At 18 - 25 pounds, gas powered models are heavier. Most will not vacuum leaves, but reviews say they are easy to start, comfortable and has reasonable power. 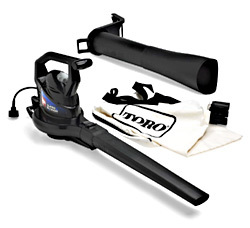 Most gas powered leaf blowers operate on 2-cycle engines. However, due to excessive pollution caused by this engine, 4-cycle models are now coming on the market. Like most backpack leaf blowers, it doesn't vacuum, just blows, but it only weighs 14.5 pounds (light for a backpack blower), and reviews say it performs and handles well. It has electronic ignition and cruise control.